The Similan Explorer Thailand liveaboard is 26 meters (85 feet) in length with a 5.5 meter (17 feet) beam. She takes 20 guests on board. She dives the Similan Islands, Koh Bon, Koh Tachai and Richelieu Rock. She carries safety equipment for safe passage at sea including first aid kits, Oxygen, a DAN oxygen kit, two 15-person SOLAS life rafts, and SOLAS life jackets for both adults and children. Her communication gear includes VHF radios, SSB radios for long distance communication, CB radios, GPS, radar, echo sounder, and mobile telephones. Nitrox is available. Similan Explorer Thailand liveaboard has two double bed upper deck cabins, four twin bunk bed cabins, and two quad-share bunk bed cabins on the main deck for a total of 20 passengers. She has a total of three very large, very comfortable shared bathrooms with showers. She carries plenty of fuel and water for all itineraries. 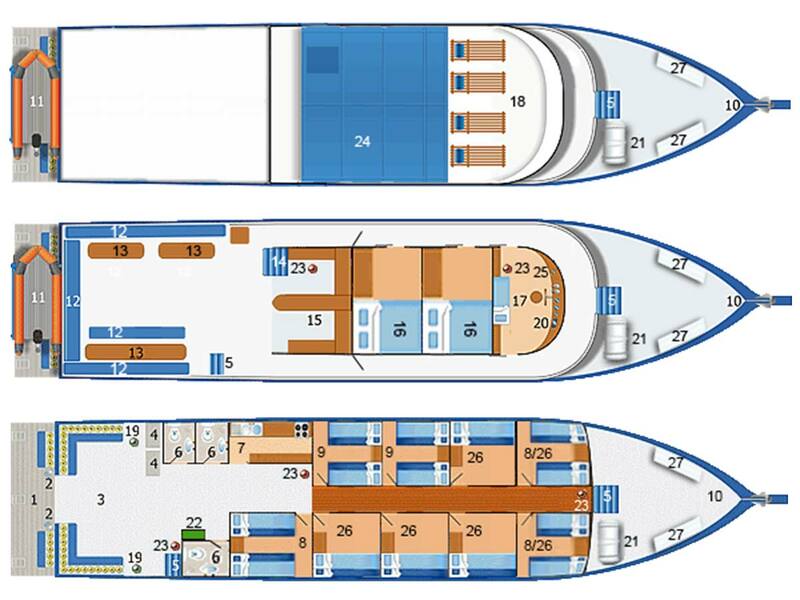 All cabins have their own air conditioner and an opening sea view window. Each cabin has 220v plug sockets for charging. There is little storage in the cabins so please pack lightly. You may leave extra luggage at the dive center. The Similan Explorer operates in Thailand. She has two itineraries to Similan, Koh Bon, Koh Tachai and Richelieu Rock. For the diver in a hurry, her three-days and three-nights cover all of the best diving areas we have, you just hurry through them. It gives you a nice overview for when you return and dive our five-day and five-night itinerary. Five-day trips include the often overlooked Surin Islands as well. She is available for individual bookings as well as charter cruises. Individual prices are listed below in the schedules, please contact us for full-boat charter prices. All Thailand liveaboard departures are from the boat’s office in Khao Lak, Phang Nga, Thailand, one hour north of Phuket International Airport. The vessel departs from Thap Lamu Harbor. Hotel pick ups in the Khao Lak area are free of charge. Transfers from the dive center to the boat are free of charge. Paid transfers are arranged to and from your Phuket hotel or airport to the boat on departure day. Transportation from Phuket. These trips depart from Khao Lak. Pick up from all areas in Khao Lak is free of charge. Transfers from Phuket are based on the area you’re staying. These prices are for up to two persons with each extra person an additional 100 baht. Please note: Approximately 10 dives. Itineraries are for general information only. We make no claims to being 100% accurate as there are too many factors affecting the schedule. We will give you the best diving on the best spots we can each day. Please note: Approximately 18 dives. Itineraries are for general information only. We make no claims to being 100% accurate as there are too many factors affecting the schedule. We will give you the best diving on the best spots we can each day.